Stone Porch by the Lake is offering a 40 percent discount on guest suites during the weekdays and special rates on weekends. Guests must book and travel between January 11, 2018 and March 31, 2018. Whether you’re a business or leisure traveler, 40 percent off our standard rates on weekdays and special rates on weekends makes it easy to get away. 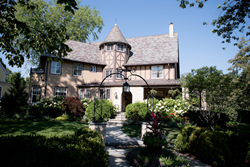 Stone Porch by the Lake, a historic, elegant Tudor mansion that operates as a fully functioning bed and breakfast with modern amenities, is offering a 40 percent discount on guest suites during the weekdays and special rates on weekends. Guests must book and travel between January 8, 2018 and March 31, 2018. Special pricing for the promotion includes overnight accommodations in one of five elegant suites, a gourmet breakfast and high-speed Wi-Fi. Each gorgeously decorated suite offers a stunning lake or city view, and includes a flat-screen TV with cable, ice bucket, wine glasses and openers, organic mattresses, a smartphone docking station and private spa-like bathroom. Each bathroom offers heated floors and heated towel racks, luxury linens, Turkish bathrobes, H20+ amenities and a hair dryer. The beautiful historic home also boasts several fabulously comfortable common areas, including a spacious wrap-around porch facing the beaches of Lake Michigan, a large Bluestone patio and a 15-foot stone fireplace in the backyard, elegant dining room, living room and a guest office. A popular feature is the guest kitchen with coffee and tea stations, fresh fruit, cereal and breakfast snacks which is fully stocked and available to guests at any time throughout their stay. Stone Porch by the Lake is located at 300 Church Street in Evanston, Illinois. The House was originally built in 1889 as a Queen Anne Style house and was transformed in the 1930s into the Tudor Rival that stands today. Stone Porch is blocks from the shopping and restaurants of downtown Evanston, a couple of minutes away from Northwestern University and less than a 30-minute ride to downtown Chicago. Whole house rentals at Stone Porch are also available, and because Stone Porch regularly hosts family celebrations, holiday parties, family reunions, meetings, gatherings and bridal showers, it is the ideal space for intimate events from 10-50 guests. Stone Porch was the winner of the 2015 City of Evanston Preservation and Design Award and is a proud member of Select Registry, an independent nonprofit association whose membership is rated to be the most upscale and unique bed and breakfast properties worldwide. Only 300 distinguished B&B properties are featured in Select Registry. To book a suite at Stone Porch by the Lake, visit http://www.stoneporchbb.com, call 847.905.0133 or email innkeeper(at)stoneporchbb.com.